A grand tasting of wines from more than 30 New York State wineries is planned for 12 March at Astor Center in South Manhattan. Visit www.nydrinksny.com for more information. Photo courtesy of New York Grape and Wine Foundation. EVERY now and then, wine producers from around the world congregate to show their wares, renting out ballrooms and inviting distributors, restaurateurs and media to attend. With beverage sales booming internationally, more wine festivals are now open to the public, allowing Jane and John Doe a glimpse and a taste of a vast array of viniculture. "Sign me up!" you say. Absolutely! Why not? Festivals and Grand Tastings are great ways to sample new wines, discover what you like, meet a lot of people, and have a ton of fun. But – there's always a but – caveat emptor: without foresight, the very thing one wants to acquire, namely wine knowledge, can be undone in the process. How? It's simple. And it's simple math. (Thank goodness, too. I never had higher math brain cells in the first place, but I digress ...) An average tasting at the local wine store may feature between three and five wines. Not a problem. Even with a second taste, the maximum amount imbibed is typically barely half a glass. A medium-sized Grand Tasting features anywhere from 30 to 100 producers, each promoting anywhere from six to 10 types of wine. Do the math: if 5 tastes equal about 0.5 glass of wine, then 8 tastes times 50 producers equal 40 glasses of wine. At 6 glasses per bottle, that would be just under 7 bottles of wine. 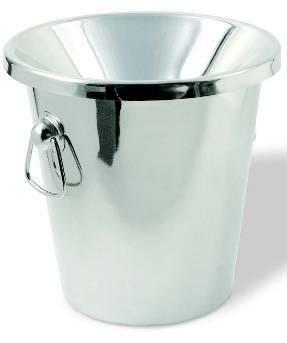 The spittoon is an integral part of the grand tasting experience. Photo from Franmara. Seven bottles of wine consumed in one setting is literally lethal. Moral of this story: No one CAN or even SHOULD try to imbibe every taste. So why are there so many bottles offered? How should one taste without, literally, tempting suicide? What’s the point? Is there a method to this madness? Yes indeed, there is. All it requires is a bucket and a slight change of perspective. Those lovely little silver (or paper KFC-like) buckets gracing the white tablecloths are not wine coolers. They are spittoons. And they are a wine taster’s best friend. SPIT. That’s right. Spit. Ignore everything Momma ever told you about spitting being nasty or unlady-like or uncouth. Here, simply spit for your own health. Spit to save your life and your liver. Spit to save the recently acquired wine knowledge. But spitting is hard. Not the ready-aim-fire logistics of spitting (although the first three times will feel awkward as hell), but defeating the urge not to do so. Temptation looms at every table. “Ooooh, that Syrah is nice,” Tastebuds say to mouth. An adult in a grand tasting is akin to a kid in a candy store. Photo by Adam Caudill. And the whole package comes together, and spit one does. One taste down. On to the next bottle. On the same table. With a row of tables. Times 10. Or 20. Or 30. It takes nerves of steel to work a Grand Tasting well. That, and an occasional lapse for something truly extraordinary. Even the best among us break down and swallow from time to time. But do so judiciously. Do the math: 10 true taste-and-swallows is a glass of wine, if the pours are conservative. At that rate, even 20 seem reasonable. But a room of 50 producers means roughly 400 potential samples. Among all those bottles, even 20 samples seem like a miniscule amount. But a mere 10 percent – 40 true taste-and-swallows – is at least 2/3 bottle of wine. In short, sampling one out of 10 may leave you blotto. The whole point of a Grand Tasting is to experience an extraordinary number of wines in one setting, something that most people would not be able to do. When’s the last time you’ve had 400 different bottles of wine at home? Actually I tell a lie: experiencing different wines is half the point. The other half is REMEMBERING the experience in order to be able to find the same wine later. What good is going to a Grand Tasting, getting blitzed, and then forgetting the wines you enjoyed? The process itself undoes much of the purpose of the experience. 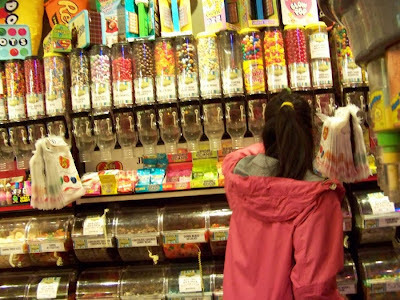 Candy and wine tend to taste the same after too much has been consumed. Photo by Rojer. 1. Preparation: Skip breath mints, mouthwash and a quick brush-of-the-teeth two hours before going to a tasting. Just like orange juice after brushing, every flavor gets distorted. Likewise, forgo drinking coffee or tea. The tannins in both coat the mouth, twisting the true flavors of the grapes. If these tips slip your mind, simply pop down a wedge of cheese – any cheese – to reset the palate. 2. Perspective: Remember being a kid in a candy store? Right. Same rule applies here. The eyes are bigger than the … well … liver. Know from the get-go that most of the wines will go untasted. 3. 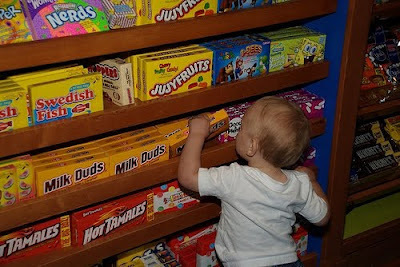 Perspective: Remember what it was like to eat a lot of different candy, so much that it’s hard to distinguish any particular one by the end? That will happen with wine, too. After a while (especially at new Grand Tasters), all wines will start to merge after the 20th spit. Pace is important at grand tastings because a single producer can offer six to eight different wines. 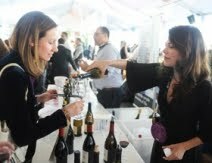 Photo courtesy of Food Network New York City Wine & Food Festival. 4. Strategy tip: Go out of order. Most producers present a flight of wine from driest and less intense to heavy to sweet. Sweet wines wreck the palate for tasting drier wines. 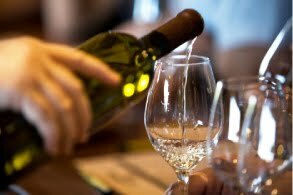 Instead of tasting the flight from one producer, try tasting white wines from different producers at different tables first. Then go back, repeat the circuit with reds. And save the dessert wines for later. 5. Strategy tip: Ask each producer to pick the best wine. S/he will blush and balk, but mention that you’re trying only one. Let him/her help weed out the so-so’s. 6. Strategy tip: Take breaks! DRINK WATER. EAT FOOD. Clear the head. Clear the palate. Something about the wine that’s appealing: smells great/I’d like to drink this with steak/reminds me of that wine I had at so-‘n’-so’s ... That way, a quick Google search will pull up the store or Web sites where one can purchase it later. Don't be shy about asking wine producers to recommend the best on their tasting table. Photo by Ed Lefkowicz. 8. Promise yourself: I will only really taste 20 wines. Think about this: it’s easy to go back at any time. Finish the circuits. Consult the notes. Find the few brilliant ones. Go back and retaste. Save the best for last. A little bit of planning and foresight will make the Grand Tasting experience an extravaganza for the senses. Go crazy! Spit often! Drink water! Enjoy. I'm delighted with wine luxury! This isn`t just a tradition of wine production to follow all canons is something more. I want to go in France but while my friend buys wine for me and presents it to me. Therefore, I fully trust his taste, and decided that a wine cooler for wine would be appropriate in my house Kalorik WCL-20629 Review . In addition, my friend brings wonderful cheeses to wine, and this is a divine combination. We are currently designing a climate controlled wine Where to Buy Decanter Labels? closet for one of our clients who is an avid wine collector. Displaying a wonderful collection of wines in a wine closet.